Hundreds Protest SCOTUS Labor Decision in NYC, NY1 (video and text). "We Can Do What Unions Have always Done -- and That's Organize!," WPIX (video and text). Eyewitness News Coverage of Foley Square Rally, WABC (video and text). gets thousands of messages; send yours right now. Supreme Court Delivers a Sharp Blow to Labor Unions, New York Times. Supreme Court Rules against Public Unions Collecting Fees from Nonmembers, Washington Post. Gorsuch Casts Decisive Vote, Slate. The Janus Decision Was Never About the First Amendment. It Was About Destroying Labor, by Bill Fletcher, In These Times. News Analysis: Supreme Court Decision Makes Unions Smaller and Poorer, but Maybe Not Weaker, New York Times. 6 Excerpts that Explain the Supreme Court’s Big Anti-union Ruling, Vox. Janus v. AFSCME is a very, very big deal. Labor’s Choice After Janus, Jacobin. The Supreme Court Janus decision is a devastating defeat for labor. Public-sector unions now have two choices: continued decline, or a reversion to the kind of militant collective action of the movement’s early years. After Janus, We’re in It to Win It, American Federation of Teachers. The AFT is our national affiliate. ‘Janus’ Was Decided by Conservative Judicial Activists Who Are Legislating From the Bench. The Nation. What the Janus Decision Means for Teacher Unions. New York Times. Supreme Court Rules Against Public-Sector Unions, Inside Higher Ed. ‘It’s Really a Race’: Supreme Court Ruling Intensifies High-Stakes Battle for Public Workers, Gotham Gazette. “The Supreme Court case that could kneecap public sector unions, explained,” Vox. | A detailed explainer about the case, the issues involved and similar cases. (June 14, 2018). 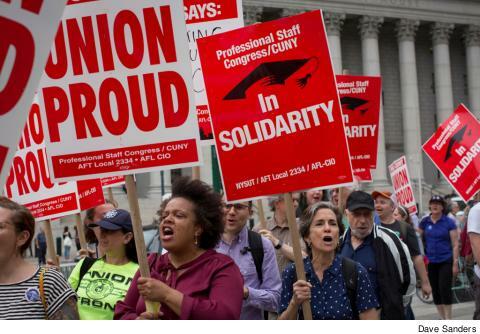 “The threat we face: How Janus could hurt labor,” Clarion | How a negative outcome to the case will affect the PSC and how the union is preparing to stay strong. (March 2018). “There’s a reason the right hates unions,” Clarion | A look at the right-wing’s efforts to erode union power and workers’ rights. (March 2018).